On the way to PAX East I had intended on getting a new version of Zifmia ready to show at the Demo Fair. It was a lofty and unreasonable goal, given the changes I was making to the service. There were several issues, including adding the very complicated branching capabilities as well as refactoring large swaths of the code. After PAX, I was continuing this work and getting frustrated with the mapping between the Zifmia object model and data storage. I was using SQL Server, which is fine for most things, but I just thought a simple object storage system would be more suitable, especially given the availability of using Linq, a Microsoft invention that allows native code queries on lists of objects. A typical Linq query goes something like this…say I want to find a session. I can do this if “db” is an object-oriented database or if I’ve implemented some mapping tool to allow for this type of query. With an object-oriented database that implements Linq, I can retrieve anything with one line of code. I can’t tell you how much easier this is to code, test, and deploy. So I went looking for an oodb that met my requirements, mostly that it was free, had Linq capability, and performed well. I [played around with a few commercial products like DB4O, but eventually settled on Eloquera. Eloquera has turned out to be an enormously helpful change in Zifmia’s inner workings. The code is much smaller, cleaner, and just as fast as SQL Server had been. Over this past weekend I finished up the unit testing, got the original AJAX regression test working, and the code is in pretty good shape. I may still go through one more refactoring, but that will be later. The goal now is to implement user interfaces, clean up anything I missed, and get games out. The code is currently checked into the FyreVM repository on SF.Net, but will move to its own Zifmia repository soon. Web/Facebook, iPad, Android Tablet, and more UI’s are on the way along with games games games. As I work through the minor technical issues of Zifmia, both client and server, some questions have arisen that seem important to how one might develop new games….specifically for the web world. First of all, we intend to remove scrolling output from the web client paradigm and replace it with paging. Every time you interact with the game engine, we’re going to store the response. Within the UI, you will then be allowed to “page” backwards (and then forwards) through the entire history of your play. Unlike a scrolling UI, the UI stays the same, only the content changes. One of the interesting changes this has on your perception is that the most important aspect of the screen is the current setting (or location). Well, that was important in scrolling too, but my experience is that the setting change and non-change turn over turn is much more impactful. If you’re interacting in the same setting for a number of turns, the static UI feels much more that you have not moved than in a scrolling UI. I’ve also been toying with the idea of polling for responses of non-movement and non-setting changing commands. So for every in-scope object, we’ll do an examine and search, store those responses in a data structure, then pass them to the client every turn. This means that the user can interact with all of the scenery without using a single turn. This adds to the perception in the static UI that the world is stable, grounded, and more realistic. If we continue down this path, I envision having background art for each region in a game, further solidifying the realistic look and feel of the setting. I’m sure there are more interesting observations coming as we experiement with Zifmia and client/server IF, but these are some of my initial thoughts. Since getting the service layer running for Zifmia, I’m now focused on the client side look and feel and getting a first iteration completed by PAX for the IF Demo Fair. 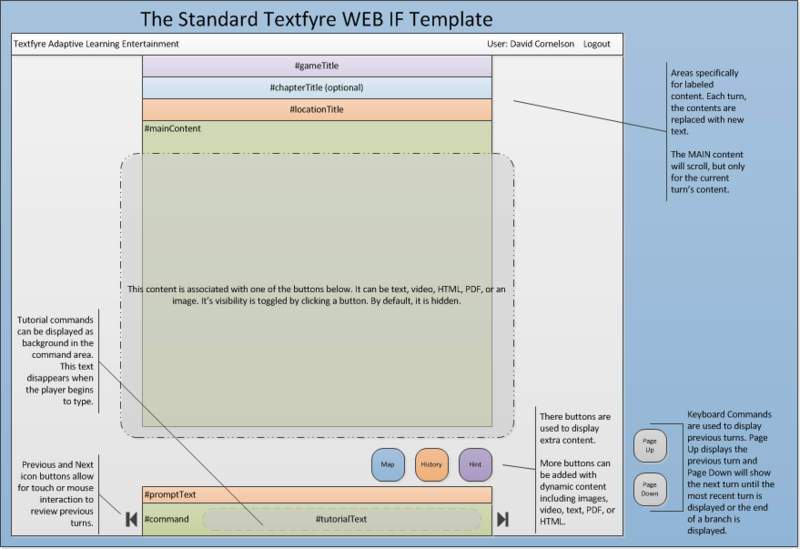 To that end, I’ve come up with a first draft of the wireframe layout. 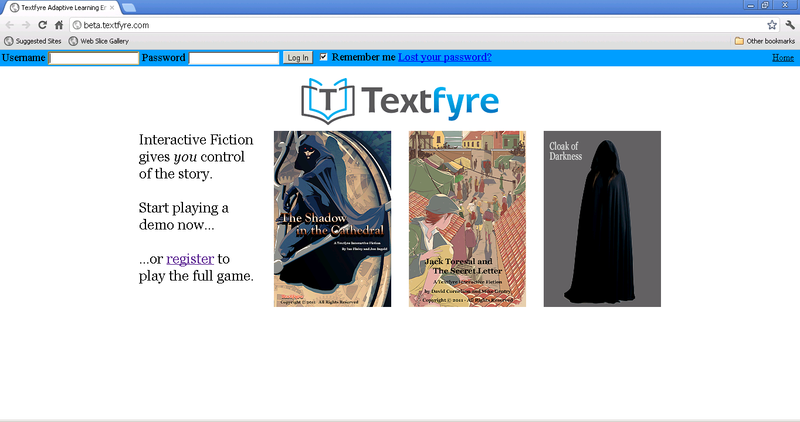 As you can see, this is very different from previous Interactive Fiction UI designs. There are tabs on the right for different types of content. 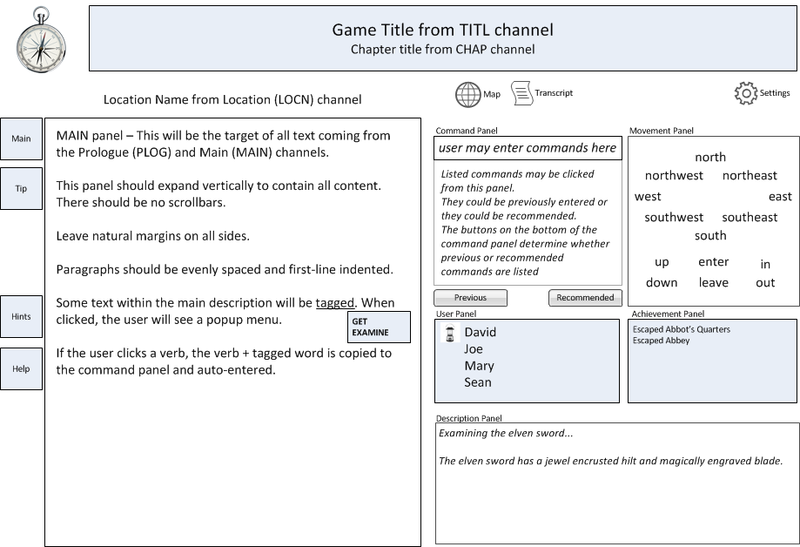 Popup menus that can auto-enter commands relative to a word in the text, a history of commands and recommended commands, a movement panel with all of the common directional verbs for auto-entering, a list of users (the lamp represents who is in charge of entering commands, everyone else is a watcher), an achievement panel, and a description panel (which will show the results of examine, search, and similar commands without using a turn – everything in-scope is known for every turn). There is still one piece missing and I’m still pondering the implementation. The user can review previous turns. This data is stored on the server. So if the user has played 100 turns, how do we show this and how can we make it easy to select a previous turn or allow paging? This is a purely UI question. Technically, retrieving any turn is a simple AJAX call. Since we’re using jQuery to design pages, we should be able to offer jQuery themes too. I will also be adding oAuth to protect the service and offer pay games, web chat, and more. I’m hoping to have the bulk of this design ready for PAX. So I have a working version of Zifmia, a client/server implementation of FyreVM. Basically, this is FyreVM with a state management wrapper where state is stored on the server. The wrapper and engine are hosted in a web service. I started developing the client web behavior with very basic html controls and it’s now time to design and create something interesting. I was wondering if anyone with mad jQuery/CSS/HTML skills might want to help out and that’s not even a request to actually write code. Even ideas on how to translate an IF game onto a web page would be great. For instance, I don’t plan to implement a running scrollable textbox with game transcript text. I want to develop a paging mechanism and use jQuery to make it fluid within the browser, so keystrokes will allow movement to previous turn output and returning to the latest “page”. I’d like to implement a CSS based compass rose that shows available visited exits and possible unvisited exits (I’ve recently implemented a new channel that reports, in XML, what the visted and unvisted exits are). I’m not much of a designer and defintely not a jQuery/CSS developer. I also have many other tasks on my plate. The result of any work is open source and will be documented and shared with the IF community.